A really light, moist and chocolatey sponge. It’s not overly sweet, and the Varlhona cocoa powder really gives it a strong and delicious chocolate taste. It’s a chocolate sponge cake recipe that I’ll definitely be sticking to from now on. Chocolate Meringue ButtercreamI tried out this new recipe on making a chocolate buttercream because I didn’t want to make a chocolate buttercream that’s too sweet. Normal buttercreams require creaming butter with truckloads of icing sugar which will make the buttercreams extremely sweet. As my friends are not very fond of too sweet stuff, I tried out an alternative. This buttercream requires the use of egg whites, which were heated up with sugar and then whisk into stiff meringue. Cold butter is then beaten in bit by bit before mixing in melted dark chocolate to make a luscious, light and not-so-sweet buttercream. The only problem I had with this buttercream is the texture. It looks quite grainy (though I’m sure the sugar has already dissolved into the egg whites during the heating process) and soften very easily at room temperature. I probably need to try this out a few more times… but one thing that I don’t like about this recipe is that it uses egg whites… which will result in leftover egg yolks and I have hardly any idea on what to do with them… Ice cream maybe? While the cake is baking, sprinkle a clean tea towel with granulated / caster sugar. When the cake is done, remove it from the oven and set it aside for 1 minute. Turn the sponge out onto the tea towel with sugar. Roll up the cake firmly from the shorter end and set it aside to cool completely. In a medium bowl, use an electric mixer and beat the icing sugar, butter and peanut butter until smooth and creamy. Set it aside. You may end up with extra buttercream for this recipe. Store the extra in the refrigerator and use it to frost cupcakes! Place the dark chocolate in a heatproof bowl. Place the heatproof bowl over a pan of simmering water, ensuring that the water do not touch the bottom of the heatproof bowl. Stir the chocolate occasionally until all the chocolate has melted. Alternatively, microwave the chocolate on medium-high, checking the chocolate every 30 seconds, until the chocolate looks shiny. Stir the chocolate until all has melted, heating it if needed. Leave the bowl of chocolate aside to cool to room temperature, stirring occasionally. Place the egg whites in a different heatproof bowl. Place the bowl over a pan of simmering water, again ensuring that the water do not touch the bottom of the bowl. Use a whisk and whisk the egg whites, adding the sugar in 3 batches. Whisk the egg whites + sugar mixture until the mixture is warm like baby’s milk and that all the sugar has dissolved. Test it by dipping your fingers into the egg whites and rubbing it against your fingers to ensure all sugar has dissolved. Remove the egg whites mixture from the heat. Using an electric beater now, beat the egg whites mixture on high speed until the egg whites had cooled down completely and the mixture is thick and glossy (stiff peaks). The egg whites will not slide even when the bowl is overturned. Beat in the unsalted butter cube by cube . The mixture will become very watery and seems like the buttercream has failed. But fret not! After adding all of the butter, the mixture will gradually come together and become a creamy and smooth buttercream. Add in the cooled, melted chocolate (hot, melted chocolate may end up cooking the eggs, so make sure it’s completely cooled!). Beat with the electric mixer on low speed until fully incorporated. Unroll the cooled swiss roll. Spread an even layer of Peanut Butter Buttercream on the swiss roll and roll it up to form a log. Cut out a short section of the swiss roll at a diagonal to from the branch. Spread some Chocolate Meringue Buttercream on one end of the branch and join it to the remaining section of the swiss roll. 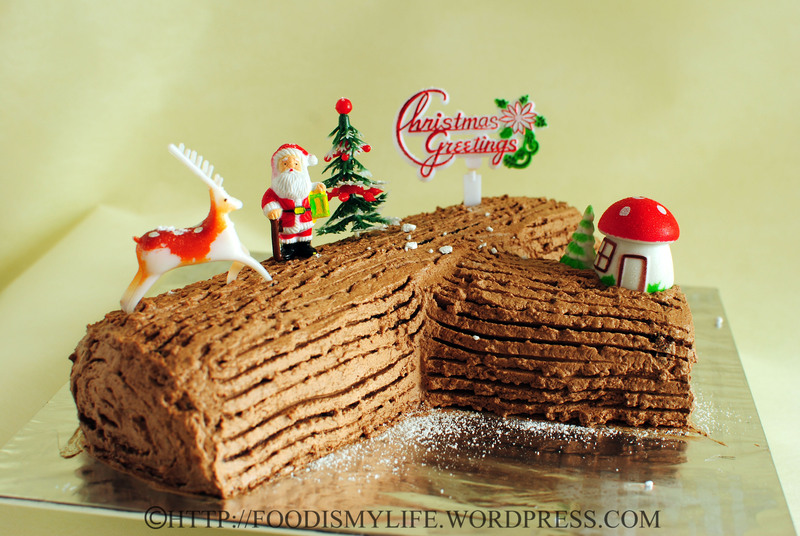 Spread a thin layer of Chocolate Meringue Buttercream all over the log cake. Refrigerate it for 10 minutes. Spread an even layer of the remaining Chocolate Meringue Buttercream all over the log cake. Refrigerate for 30 minutes. Using a fork, draw lines all over the log cake and use a skewer to draw a spiral on the ends of the log cake. Decorate with Christmas decorations. Refrigerate until ready to serve. I’m submitting this to Aspiring Bakers #14: Creative Christmas Bakes (December 2011) hosted by Hankerie. Bobbi: Thank you so much! I took about 4-5 hours to make this cake… but I was really glad my friends loved it. (: Do take care too! Joanne: Thanks for sharing the peanut butter buttercream recipe! Love it to bits and pieces! Peanut butter buttercream is my favorite!!! You’re right, it’s very balanced. Love the stuff.